First trained as a Physical Education secondary school specialist, Linda entered the public community sport and recreation sector for the first 12 years of her career. She then worked in the private sector developing her specialism in HR and training before starting her own training and consultancy company, Almanac which she ran for some 10 years. 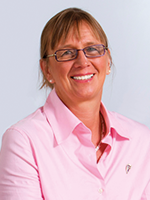 This took her to the National Training Organisation for Sport (the forerunner for the Sector Skills Council, SkillsActive) and onto Sports Leaders UK where she has been Chief Executive for the last 11 years. Operational management experience across provision of sport and physical activity participation opportunities in public, private and charity sector sport provision. Education and training in sport and physical activity. Formerly involved with the professional bodies for sport and recreation management – ILAM, ISRM at national and regional level. Currently serving as Vice-Chair on MK Sport the local sports council and inaugural Chair of the COMPASS trade association for physical activity providers. Awareness of GP referral initiatives and successor schemes. Oversee a national Awarding Organisation for sport and physical activity leadership which works across primary, secondary, tertiary and HEI sectors as well as community education and training. Long background in the development of National/Scottish Occupational Standards, qualifications and training. Physical Educationalist. Experienced trainer and speaker. Experienced report and article/paper writer. Built current charity from 9 weeks reserves to consistent 12+months to establish a sustainable social enterprise free of reliance on core grant aid. Majored as a consultant in organisational change projects during the public sector introduction of compulsory competitive tendering. Currently working with one major commercial sponsor and developing other CSR and strategic partnership relationships. Developed a social enterprise within the Charity and run own freelance consultancy for a number of years.